I am continuing to update my blog on this pregnancy, and while I actually hit 12 weeks today, I am holding off on that post and writing through 7 weeks and seeing our baby for the first time. At 6 weeks morning sickness arrived. No vomiting, but just after my first meal I would get a little nauseous and again in the evening until bedtime. I also had a headache and some dizziness a couple of times so I was feeling pretty crappy. I could not work out until my doctor's appointment so there was no happy endorphins to get me feeling better. To top it off I got my Victoria Secret swimsuit issue at the same time as getting a bellies pregnancy spa clinic advertisement…cruel joke! 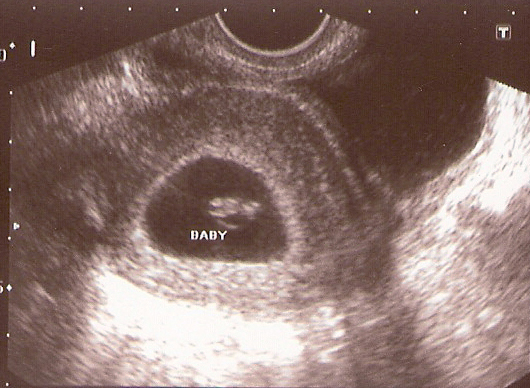 6 weeks 6 days was our first ultrasound…I was so anxious to see the baby and hear a heartbeat (and so nervous) that I literally couldn’t sleep. I woke up dry heaving (oh joyous morning sickness…that was the first time and I think it was partly nerves). We got to see our baby, see and hear it’s heartbeat and it was perfect. I always thought I would cry, but I didn’t…just like for my wedding I was just too happy to cry...plus it was a little surreal. We got a few print outs and I got to talk to the doctor about all my fears (and there are lots). The baby’s heart rate was measuring at 139 bpm and it was measuring at 7 weeks 3 days, but we didn’t change my due date yet…still November 9th. More great news was that I was able to go back to bootcamp! The doctor was actually mad that the nurse told me that...especially since I had been doing bootcamp for 6 months before I got pregnant. He did warn me that my beastly hunger could hurt me, and I could gain a ton considering most people don't want to eat in the first trimester...great. After such a wonderful first appointment we decided to tell my extended family with an e-mail that had a short poem and photos of the ultrasound. Everyone seemed surprised and excited…I now have a prayer team!...and my mom doesn’t have to hold it all in.